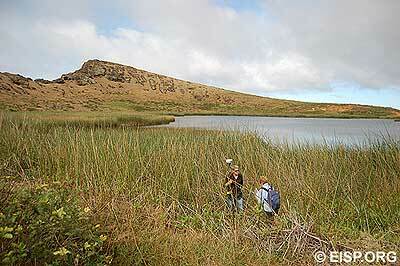 Rano Raraku is partially filled with a marshy, fresh water lake roughly 350 m in diameter and encircled by thick reeds. Our historic photographic database reveals that the width of the reed cover relative to the apparent outline of the lakeshore has varied significantly over time. Today it covers about 45% of the southern third of the lake’s surface. While Rano Raraku preserves its original form as a parasitic cone of Maunga Terevaka, its southeastern exterior slopes have been eroded by ancient marine action to create a steep cliff some 300 m high. Jo Anne Van Tilburg and Matthew Bates survey the lake edge amongst marshy reeds. Modern studies of Late Quaternary sediments collected in core samples taken from Rano Raraku have been conducted. The first revealed a continuous fossil pollen record from the last 30,000 years, allowing investigators to draw two important conclusions: that the island was once covered with dense forests of palm and other trees and shrubs, and that deforestation took place over the last 1200-800 years. In March, 2005, further fossil pollen collected in a more recently sampled core from the same lake underwent stratigraphic and spectroscopic color analyses that yielded supporting evidence of forest disappearance on the crater’s interior by c A.D. 1000. Furthermore, the 2005 study revealed a clearly evident transition from annual laminated sediment to massive sediment, with wetland formation occurring c A.D. 1200 and a frequent influx of stone and earth debris evident. It is logically inferred by the researchers responsible for both studies that forest disappearance in Rano Raraku interior was human induced and caused by intensive moai quarrying activity on the volcano’s southeastern interior slopes. The consolidated tuff or tephra ash of Rano Raraku evidences well-defined textures from coarse, medium, to fine and was laid down in rough, dipping layers or “beds.” Using relative size as the main criterion, geologists have defined classes of dense basalt (lapilli) scattered throughout the tuff. While Rano Raraku tuff is a superb sculptural material in terms of the relative ease of carving, it is also fragile. 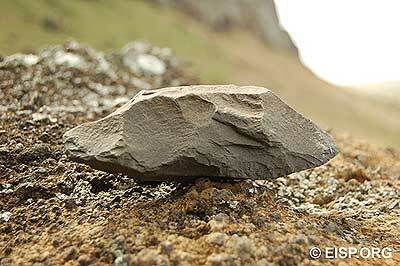 Bedding of the tuff appears to be a factor in the angle at which moai were cut in the quarries. Lapilli impeded the carving progress on some statues or disfigured the surface appearance of others sufficiently enough to cause abandonment of individual projects. Closeup of friable and porous Rano Raraku tuff. 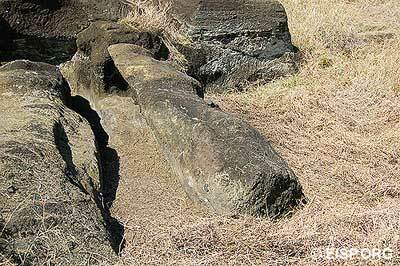 Rano Raraku tuff is friable, porous, and susceptible to deterioration. These and other inherent weaknesses of the stone material, coupled with the fact that Rano Raraku is a major tourist destination, create an urgent conservation imperative. 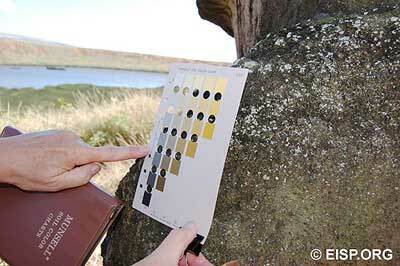 Comparing Rano Raraku tuff color to Munsell charts. We have digitized the topographical information contained within Rano Raraku quarry zone and in each of the 20 3 x 2.5 km quadrangles published to date and presented by Cristino et al. in the published Atlas. Objects surveyed are classified as “sites” or “features” and indicated by dots to which letters or numbers are attached but not defined. We have localized these by the given map coordinates. Within Rano Raraku archaeological zone, the Atlas maps indicate 680 localized “features” and 529 “sites.” Unlike the survey quadrant maps, however, twenty-one map icons define the class of object localized. For clarity, our nomenclature drops the “site” and “feature” designation and re-defines surveyed “objects” located and mapped on the ground and capable of being considered as either sites or features, depending upon their individual circumstances. These objects, whether singly or in clusters, have been assigned 1 of 6 flexible interpretive use or purpose descriptions (all widely acceptable in Easter Island studies). The EISP database has also created a survey identification code to denote 29 specific “object” types we have encountered in the field or in museum or archive collections. These object definition codes are clustered in 5 groups, with Group 1 being Monumental Sculptural Objects (3-dimensional) and including moai and their frequently encountered, specific partial or complete forms, such as head, torso, moai fragment or, in Rano Raraku quarry only, shaped block. Rano Raraku tuff is arrayed in roughly horizontal bands and exposed in irregularly shaped flows (papa) on the north-facing, upper side of the volcano’s interior. There the papa slopes to 28 degrees and was visually sub-divided on the published archaeological map into two large and spatially discrete areas: Section C on the west and Section D on the east. This sub-division is logical and completely drawn from the visual quality of the tuff distribution on the interior. Because they are different in elevation and tilt, these sections vary in stone quality, accessibility, and workability. This geological variation is easily recognized. The workings on the exterior of Raraku first attract attention; here their size, and incidentally that of many of the statues, has largely been determined by fissures in the hillside, which run vertically and at distances of perhaps 40 feet. The quarries have been worked differently, and each has a character of its own. Quarry with a detached moai in Rano Raraku Interior. 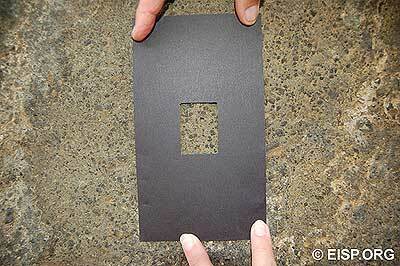 We have differentiated 19 discrete quarries within Rano Raraku. Those in Section C (west) are defined by the presence and extent of variously sloped papa. Those in Section D (east) are defined by lines drawn from natural fissures in the rock which are discernable as natural breaks or cracks in the rim edge. We have collected a total of 10,000 survey points within Rano Raraku interior defining 201 objects. Within Section C we have 67 numbered objects, of which 24 are statues; 14 are statue heads; 01 is a statue torso; 27 are shaped blocks, and 01is a statue fragment. In Section D we have 80 numbered objects, of which 47 are statues; 11 are statue heads; 01 is a statue torso; 18 are shaped blocks, 01 is a possible statue; 01 is a non-statue object and 01 is a statue keel. On the interior slopes we have 59 surveyed objects, of which 22 are standing statues; 22 are supine, lateral or prone statues, and 15 are either non-statue objects (features) of interest or objects not fully identifiable as statues. In Rano Raraku exterior slopes we have surveyed 241 objects, of which 38 are standing statues; 61 are supine, lateral, or prone statues, and 142 are non-statue objects, undefined or un-relocated objects of interest (features). Within the entirety of Rano Raraku zone we have recorded available total length measurements or secured total length measurements from Routledge’s unpublished notes on 313 objects, of which 205 are moai. The tallest statue in the exterior quarries is the well-known “Te Tokonga” at 20.56m. The tallest statue in the interior slopes is RR-001-123 at 9.25m. 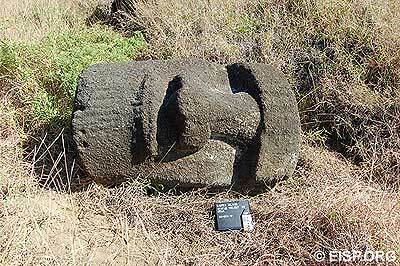 A moai head separated from its torso on the quarry slopes. Our project reveals that Section D (east) produced the majority (54%) of objects mapped; it also produced the majority of statues recorded. The size range of statues in the two sections varies, but the tallest statue in the quarries is in Section D. In terms of shaped blocks, however, there are 18 in Section D and 27 in Section C. Shaped blocks are considered to be statues in process above which earlier statues have been removed. One interpretation of these observations is that Section C (west) was in use longer than Section D (east), while Section D (east) produced bigger statues. 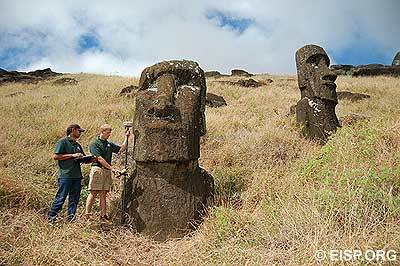 Rano Raraku was a terminal source of production in which the final product (the moai) was produced and then conveyed to the entire island. Secondly, it was also a local zone of production in which the final product was produced, retained or conveyed to the eastern region at roughly double the rate of the western region. Given the lack of variability in evident quarrying techniques, it is not surprising that shapes and sizes of moai are essentially standardized. The control of technique and product reveals the hand of relatively skilled craftsmen. An example of toki found in the quarries. The frequency of mistakes in statue form is extremely small. The number of discarded or rejected statues is also small, and usually the result of faults in the stone material rather than the mistakes of the human hand. When the number of these discarded or rejected statues is compared to the total quantity of statues produced, we see that the manufacturing techniques were accurate and fairly sophisticated. Methods for correcting errors, including re-carving of such features as the hands, can be observed. There is no evidence that access to the quarry material itself was restricted. However, a ring of hare paenga foundations mapped by Cristino et al. 1981, many of which are now damaged or lost, once encircled the base of the volcano. This suggests some sort of restricted access. Furthermore, the entrance to Section C at the toe of the slope is marked by a paenga, as is the exit to Section D at the opposite end of the crater. Resource procurement in the interior quarries was highly directed towards the type and accessibility of the outcrops. The general picture that is emerging is that quarrying was systematic and undertaken for short periods or irregular intervals. It is completely evident in the distribution, total numbers, size and weight of all documented sculptural objects island-wide that parity and balance were hallmarks of the sculptural tradition. This appears to have been the result of carefully controlled production strategies closely tied to surplus food distribution. Finally, it is evident that the agricultural success of the lower-ranked eastern region was a major factor in the over-production of sculpture, and that the surplus objects were retained and displayed in the eastern region purposefully. One can interpret this action as a change in the social balance and an indirect challenge to the higher ranked western region. Hyvert 1972; Domaslaski 1981; Bahamondez P. 1990; Charola 1990; Van Tilburg 1990).